Army Specialist K. C. Eusebio of the United States Army Marksmanship Unit (USAMU) edged out B. J. Norris to win his second Steel Challenge World Speed Shooting title in Piru, California. Eusebio finished with a record time of 79.16. K.C. first won the Steel Challenge while still in High School — an amazing performance for such a young shooter. K.C. has set speed-records for many of the Steel Challenge’s stages, including “Smoke & Hope” shown in the video. Eusebio’s win is the third time an Army Marksmanship Unit member has taken the title in the past four years. Staff Sergeant Max Michel took the title in 2005 and 2007. 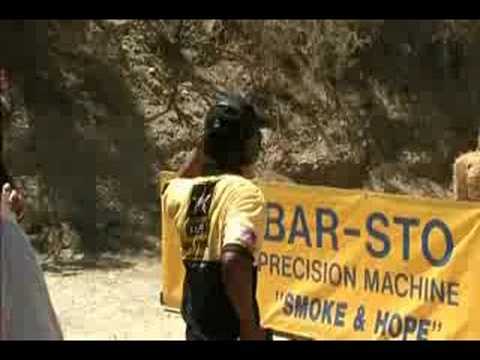 Below is exclusive video taken by AccurateShooter.com at the Steel Challenge on August 16. CLICK HERE or on screen to WATCH VIDEO. In the women’s division Kay Clark-Miculek took her seventh Women’s Steel Challenge title with a time of 105.85. Miculek now has twice as many titles as any other female shooter. In the Limited Category, Phil Strader of the US Shooting Academy’s 93.49 time was good enough to defeat 2006 World Champion JJ Racaza by just over 9 tenths of a second. Share the post "K.C. Does It Again — Eusebio Wins 2008 Steel Challenge"
While covering the 2008 Steel Challenge, this editor tried a new style of shooter’s earplug, the 3-flange SmartFit™ from Howard Leight. 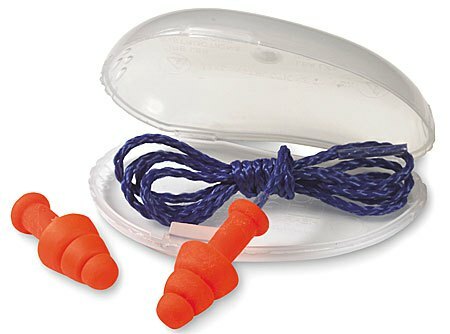 First, let me say that I have, in recent years, always used the bullet-shaped soft foam earplugs because they offer the highest Noise Reduction Rating — up to 32 db NRR. But I am VERY impressed with the SmartFits. I want you guys to know that these are VERY different than other ridged plugs on the market. Some other brands use a stiff plastic that is downright painful. Not the SmartFits. These are made of a very soft, “conforming” polymer that is surprisingly comfortable. Simple body heat actually causes the advanced material to conform to the ear channel. For me, SmartFits were at least as comfortable as soft foam plugs. If you wet the SmartFits slightly, they slide in very easily. You don’t have to roll them up with your fingers. There is a half-inch-long stub on the outside of each plug. This makes it very easy to insert or remove the units. I can definitely pop these into my ears more quickly than with the foam plugs. And, using the little stub, they come out super-fast. The set of SmartFit plugs I tried were fitted with a braided nylon connecting cord. The cord is plenty strong and doesn’t pull out like the stretchy rubber cords on some other sets of plugs. This is a sturdy connection appropriate to a product marketed as a “multiple-use” earplug. The Howard Leight SmartFits are only rated to 25 db NRR. That’s “middle of the pack” noise reduction — better than most muffs but not as good as some plugs. I can tell you, however, that these things really cut sound, and in the field they performed as well or better than some foam plugs with higher ratings. With both SmartFit plugs in my ears, gun noises were masked very effectively. And to my surprise, I really couldn’t talk with someone at all unless I removed at least one SmartFit plug. With some other ear plugs I’ve found you can still hear voices even with a plug in each ear. That tells me the “real world” effectiveness of the SmartFits may be higher than the rating suggests. Bottom line: These SmartFits are comfortable, easy to insert/remove, sturdy, and they last a long time. The SmartFits can be cleaned easily with soap and water, and they can be purchased with a flip-top dispenser for secure storage. Great Product that really works. I now keep two sets of SmartFit plugs in my range kit. There are times when I’ll still use foam plugs, but for most situations I think the SmartFits are easier to use. 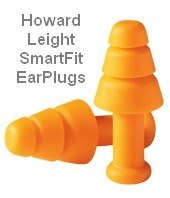 Share the post "SmartFit Ear Plugs — Recommended New Product"